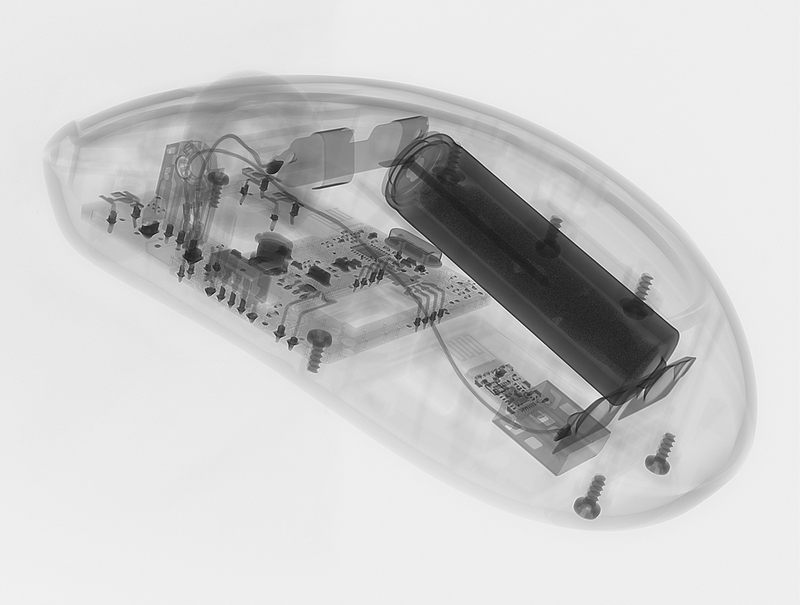 Following “The Evolution of Electronic Light Bulbs” last year, Herminso Gomez has expanded the theme with a new series of images depicting “The Evolution of the Computer Mouse”. Using the Nikon Metrology XT H 225 ST, Herminso’s CT scans reveal just how much the internal features and dimensions have changed over the years, as well as the external ergonomics and aesthetics. Below, take a look at some of Herminso’s images featuring the evolution of the computer mouse as well as the evolution of the Apple mouse and some close-up images of both. To find out more and see the full series take a look at the OSA Optics & Photonics News – 2016 photo contest. 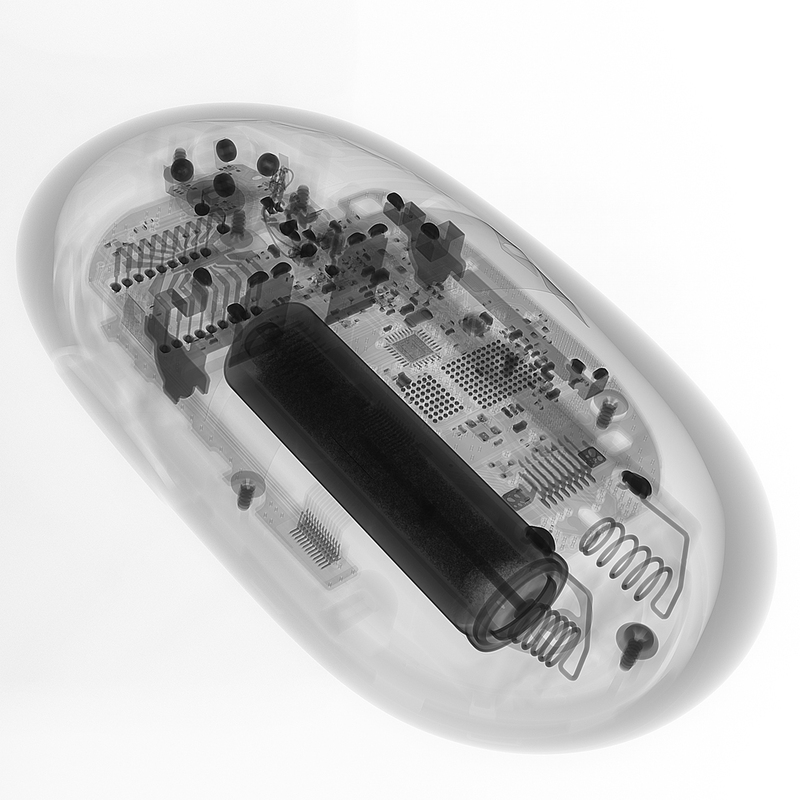 As illustrated by X-rays, these snapshots depict how the design of the computer mouse has evolved from wired electro-mechanical trackballs to a wireless optical/laser tracking mechanism. From left to right: Apple Desktop Bus Mouse II M2706, Dell Optical Laser USB Mouse 01KHD8, and Microsoft Wireless Nano Transceiver Mobile Mouse 1000. A Microsoft Wireless USB Nano Transceiver Mobile Mouse 1000. Imaged with the X-rays of a Nikon’s XTH225-ST computed tomography system. 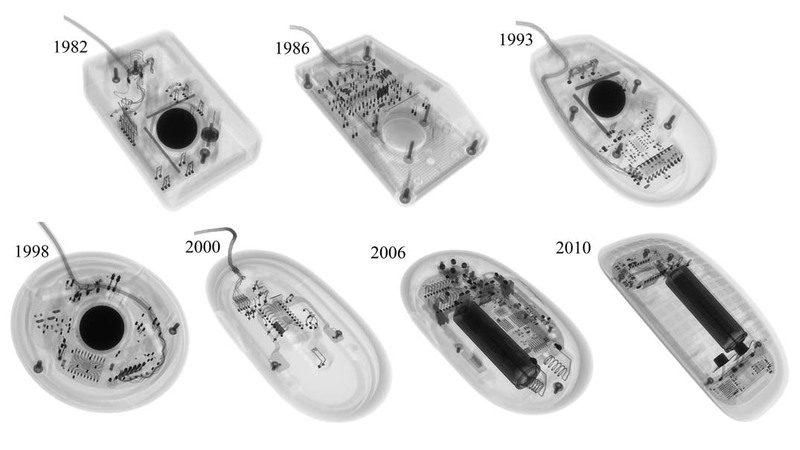 As illustrated by X-rays, this brief history of the Apple mouse shows how its design evolved from wired electro-mechanical trackballs to wireless optical/laser tracking mechanisms; from a two button to a wireless multi-touch design; from a rectangular block shape to trapezoidal, circular, and elliptical shapes becoming increasingly more ergonomic. A Wireless Optical/Laser Apple Mighty Mouse A1197. Imaged with the X-rays of a Nikon’s XT H 225 ST computed tomography system. All Image Credit: Herminso Villarraga-Gómez, Nikon Metrology, Inc. If you are a manufacturer of components or assemblies incorporating plastics, metals, ceramics, electronic components or any combination of these, Nikon Metrology has in-house Inspection centers to perform X-ray and CT contract inspection services for new or existing clients. To find out more, click here. Don’t forget to sign up to the Nikon Metrology newsletter, for the latest news direct to your inbox, here. Or for more articles on X-ray and CT, click here.